We love working on jobs where we can use our imaginatio! This is one project that was a lot of fun and where the window treatments really added to the design of the room. For most of the windows we used Plantation Shutters with 4 1/2” louvers. But for this Family Room we decided that all we would use at the windows would be custom drapery panels. We wanted a light fabric because the patio has a large overhang and not much sun gets in. On the back windows in the Breakfast Room and Study we will be using a simple roller shade with an organic feel made by Hunter Douglas. These shades will give protection from the sun but when the sun moves to the west, up will go the shades. And everything is in a light bright fabric. We all are very happy with how everything looks. And as you can see there are many windows so our customer decided to use the PowerView Motorization Lift system. This will be very convenient once the sun is overhead and then again in the evening. Stop by one of our Hunter Douglas Gallery’s - one in Plano and one in Southlake. Our Designers can show you all of the newest products along with the lift systems. They can show you and explain the exciting PowerView lift system and explain haw it can connect with “Alexa” and other programs. And if you love the softness of draperies, we can help you can up with a design and fabric selections that will Wake up Your Windows. You can find Hunter Douglas products and Custom Draperies at Read Design in Plano and in Southlake. We service the following areas- Frisco, Celina, Prosper, Dallas, Highland Village, Richardson, Plano, Allen, McKinney, Southlake, Grapevine, Colleyville, Fort Worth, Trophy Club, Rockwall, Rowlett, Highland Park, Preston Hollow and everywhere in between. Custom Plantation Shutters... and best of all - Made In America!!!! Yes, Plantation Shutters are still as popular as ever and are still a great way to add value to your home. Shutters for your windows will last for generations and is one window treatment that is seldom changed if you sell your home. This is especially true with Wood Plantation Shutters. The beauty of wood is classic, will add warmth to your home and will last a lifetime. And today their are many different choices you can make including louver size, trim design, hidden or standard front tilt, divider rails, custom paint or stain color, and hinge color. Introducing Heritance Hardwood Shutters by Hunter Douglas. The simple elegance of rich, hardwood shutters gives lift to any room. Now, the maximum strength and durability of our Heritance Hardwood Shutters make them a wise investment in many ways. They feature dovetail construction and a vast selection of frame choices, specialty shapes, and louver sizes- and a variety of paint and stain finishes, as well as custom colors. Also available in six Handcrafted Series Techniques to enhance the inherent character and color of the genuine hardwood and making your shutters truly one of a kind. The first technique is textured, which enhances the woods natural grain and creates a contrast and depth of the natural wood grain. You can also choose glazed which enhances the richness of the stain finish with a hand rubbed glaze. The Glazed and Burnished technique creates an antique effect. With the Rustic technique the natural characteristics of hardwood are arranged so you will have your own unique shutter. The Heirloom distressed technique will give your shutters an Old World effect with the addition techniques. Including burnishing,, rasping, and flyspecking. An finally the Classic Technique give the wood a beautiful worn finish with the techniques including glaze, dents, cracks and wormholes. Or you can choose any of our paint selections including Custom Paint Match. So how does it work? Give Read Design Plano or Read Design Southlake a call and schedule an appointment with one of our Designers. We will gladly meet with you at your home and check out the windows where you would like shutters. We will suggest louver size keeping in mind scale of the window and room. We will also help you decide on the trim and which tilt system is best for your look. And finally we will help decide if paint or stain is best for your design and walk you though the different techniques. Read Design is a leader in Hunter Douglas Window Coverings with 2 Gallery locations, one in Plano and the other one in Southlake. We offer personalized service that you will only find with a locally owned store. This is our family business and we are here to help you personalize your own design. Stop by and see over 60 working displays including PowerView, the latest in home automation. Our designers can also help you with drapery and window treatment selections as well as anything you might need for your home including furniture, rugs, lamps and home decor items. Here is one of our projects which includes Custom Plantation Shutters. We had the walls painted and then came back and designed drapery panels to finish off the look. Next we will be moving on to the Dining Room. And at our Plano Store you will see our new displays of our RD Home Collection where you will find anything you might need for you home. New products are coming in weekly! Don't miss out on Hunter Douglas rebates going on now (shutters excluded). Give us a call now to learn more about all our different products and features and benefits of each. We look forward to working with you! Britt and her family bought a new home in Allen, Texas. Most of her windows are covered with wood blinds, but for her family room she wanted something different. Something that would make a statement and shout elegance. We choose to start the design with Hunter Douglas Vignette Modern Roman Shades. The Earth toned, textured fabric with the soft folds create a crisp, clean look. And because she has two small children, we added the LiteRise (cordless) lift system because of Child Safety. The shades were installed on the French Doors and on the two narrow windows beside the doors. They were the perfect solution because when lifted they give a great view to the backyard letting her to easily watch the children play and they stack elegantly at the top. And when they are closed they cut the glare on the TV and offer privacy and light control. Then we went on and added drapery panels to the sides to soften the wall of windows and to add color. Come in to Read Design located in Plano, Texas and Southlake, TX to see our working samples of our Hunter Douglas Vignette Modern Roman Shades. 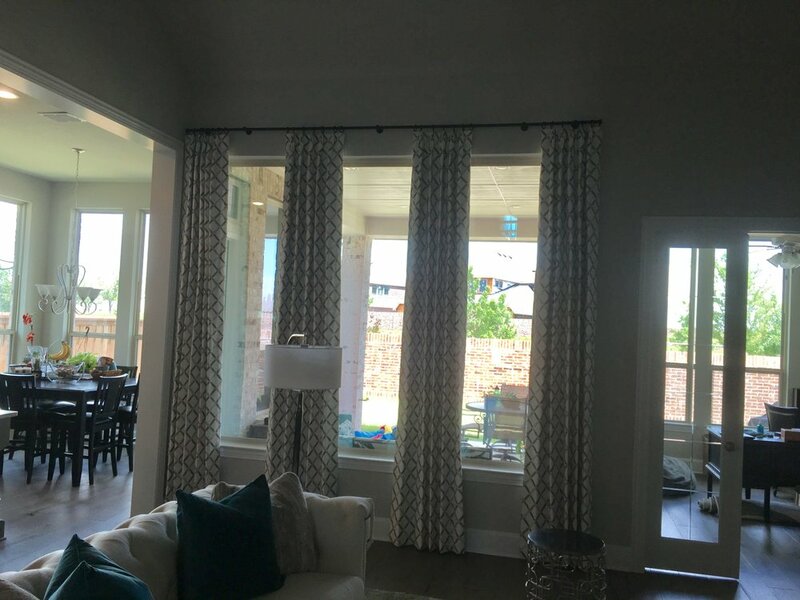 They are offered in semi-sheer, translucent and room darkening fabrics, the two styles and three fold sizes help you create warm, inviting, and beautiful windows! Providing Hunter Douglas Vignettes to all of these areas: Dallas, North Dallas, Plano, Carrollton, Farmers Branch, Addison, Coppell, Southlake, Denton, Keller, Roanoke, Benbrook, Westlake, Fort Worth, Lewisville, Grapevine, Trophy Club, The Colony, Frisco, Prosper, Celina, Savannah, Aubrey, McKinney, Allen, St. Paul, Wylie, Sachse, Rockwall, Rowlett, Lucas, Parker, Melissa, Anna, Fairview, Heath, Garland, Richardson, Irving, Las Colinas, University Park, Highland Park, Kessler Park, Euless, North Richland Hills, Colleyville, Flower Mound, Corinth, Arlington, Little Elm, Hurst, Saginaw, Haltom City, Bedford, Watauga, Haslet and many more!